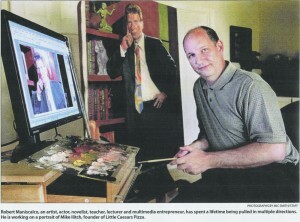 Robert Maniscalco poses in his studio at his Summerville home. Though he is at once artist, actor, novelist, teacher, lecturer and multimedia entrepreneur, Summerville’s Robert Maniscalco isn’t entirely comfortable with the tag “Renaissance man,” however descriptive the phrase may be. Not that the Detroit transplant, 47, has any problem with underscoring his talents or promoting his work. The artist who doesn’t is the artist who fails. OCCUPATION: Painter, writer, teacher and multimedia artist. FAMILY: Wife, Amanda; son, Danny; daughter, Mary. IN WHAT FIELD DO YOU FEEL MOST AT HOME? : Painting. It came most naturally to me and was the “easiest” for me to do. HOW DO YOU FIND THE TIME TO DO ALL THIS? : Time? As people, we have nothing but time. DOES BEING A PORTRAIT ARTIST HAVE ITS DOWNSIDE? : I occasionally get tired of painting men’s suits. WHAT’S PERCOLATING? : I’ll be teaching a portrait painting workshop at the Gibbes Museum of Art, February through March. BIGGEST CHALLENGE: Trying to be an artist and a stay-at-home dad. Both require the same qualities: creativity, perseverance and love. This former gallery owner, born in Detroit in 1959, has spent a life happily being pulled in multiple directions. Maniscalco was drawn to singing and acting as early as high school, when his men’s octet placed first in a state competition. He went on to earn a bachelor’s degree in music at Wayne State University in 1983, where he was principal clarinetist in the symphony band and orchestra. He began singing professionally in quartets and as a soloist in area churches. New York beckoned two years later. Maniscalco sang in a cabaret quartet while studying acting at the Circle in the Square Theatre. Over the course of eight years in Gotham, he continued acting and premiered several original vocal compositions with the New Renaissance Chamber Artists, performing at Carnegie Hall in 1991. His years in New York culminated in a one-person exhibition at the Limner Gallery in 1992. Later, during a three-year (1995-97) residency in New Orleans, he focused on his commissioned portrait career, yet still found time to sing with an early music ensemble, Musica da Camera, and with the Louisiana Philharmonic Orchestra Chorus. The artist ventured home to Michigan again in 1997, soon founding the Maniscalco Gallery. Not content to confine himself to his studio, Maniscalco hosted “Art Beat,” a PBS series on Detroit Public Television through which he examined the creative process with celebrated guests. But within a month of closing the Maniscalco Gallery in Grosse Pointe in 2005, Maniscalco, his artist wife, Amanda, and their kids, Danny and Mary, moved into new Summerville digs, in part to be closer to her mother, who had settled in South Carolina 10 years earlier. “We visited her often and simply fell in love with the area,” Maniscalco said. When Maniscalco was a youngster, his dad occasionally would permit him to “skumble” in the large background areas of the father’s canvases, but it was years later that the son actually apprenticed with him. The senior Maniscalco knew potential when he saw it; his son sold his first painting, a copy of Jacques-Louis David’s “Napoleon” on horseback, when he was 7 — for $3. He fares a bit better today. Since 1980, Maniscalco’s commissioned portraits and fine art have become part of more than 850 private and public collections in North America. Painting came naturally to Maniscalco. Establishing independence took greater effort. Of late, he also has started work on a series of paintings depicting the Lowcountry landscape. Maniscalco returns to Detroit several times a month to work on portrait commissions. Maniscalco remains an advocate for the arts, having raised an estimated $250,000 through donations of his work to fundraisers and silent auctions to benefit medical research, education and the drive to fight homelessness. As someone keen to contribute to the cultural conversation, it comes with the territory. I knew a Joe Maniscalco senior that lived in Grass Valley Ca.in the 50’s . He was a painter . I am familiar with the other Joe Maniscalco. My father studied in NYC and lived in Detroit. Thanks for checking in!